We accept walk-ins Monday-Saturday. Our hours of operation 9 a.m. to 8 p.m. Monday to Saturday. We accept our last walk-in at 7pm. Sundays No Appointment Necessary from Noon to 5 p.m. LOOKING FOR A PLACE TO START YOUR CAREER? WITH HANDS ON TRAINING & MUCH MORE! GIVE US A CALL FOR AN INTERVIEW BRAIDERS AND STYLIST ARE WELCOME! Come visit our talented stylists for one of your hair needs. 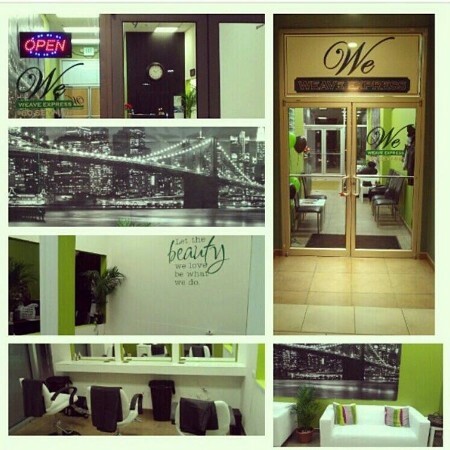 Visit our weave salon in Baltimore, Maryland, for a more gorgeous you. I would like to say thank you to all of our clients that we have had the pleasure of serving our community since 2010. Thank you for all of your patience and business in our growth at Weave Express. On behalf of all of us we thank you. I personally would thank my entire family and friends for all their support and the Grace of My Lord Jesus Christ.